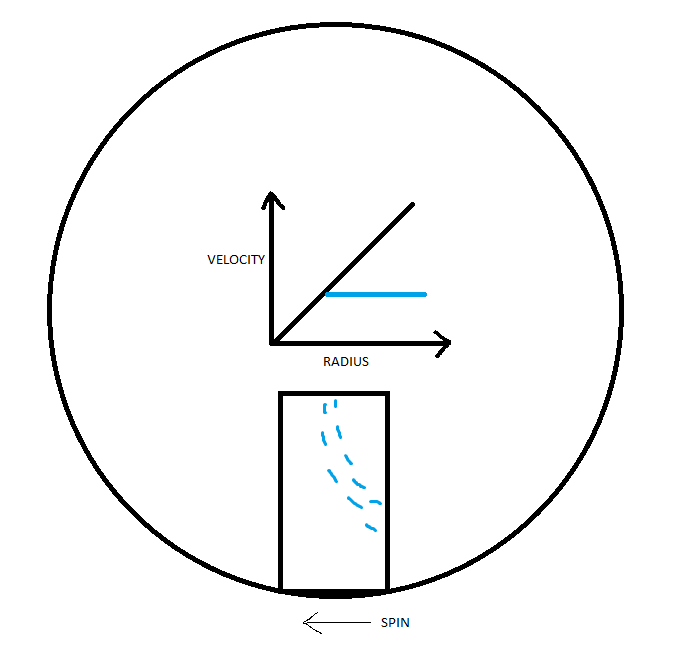 As the water "falls" from shower head height towards the drain at the floor, it would be moving at a fixed velocity and be rotating slower than it should at the increased radius of the bottom of the shower, so it would tend to lag the rotation and bend backwards to the direction of spin. The relative strength of this effect would be dependant on the overall habitat diameter. Larger habitats spin slower to simulate 1g, making the velocity gradient over a normal shower height smaller. For example a 500 meter radius station (with 1g at 500 meters) with shower bottom at 500 meters and top at 498 meters, would have tangential velocity of 70.02 and 69.74 m/s at the bottom and top respectively. So the water leaving the shower would move anti spinward at ~0.28 meters/second. Given that the water would only take ~0.6 seconds to fall 2 meters it would move ~0.17 meters sideways. This distance could be noticable, but angling the showerhead or other simple design solutions could completely overcome the issue. Set radius at 500m and 1g, set radius to 498m and use the same angular velocity from the previous calculation. Not the answer you're looking for? Browse other questions tagged science-based space-colonization or ask your own question. What minimal radius is needed for rotation to simulate gravitation without averse effects on humans? Would there be any advantage for a rotating wheel space station to adopt mobius strip design? How would a corpse be preserved in outer space conditions?